So much of the reason why I feel successful and in control of my kitchen is due to one amazing app: Paprika. Paprika is primarily a recipe management app, but I use it to integrate my recipes, my weekly meal plan, and my grocery list. Within one app, I can scroll through my favorite recipes I've saved from the internet or from my Pinterest board, choose what I want to make for dinner that week, and add the ingredients for each recipe to my grocery list. I take the mobile app version of Paprika with me on my phone and use it constantly as I wander up and down the aisles of the grocery store every Sunday. While I love having somewhere to keep all my recipes that's easy to use and cook from (which you'll learn more about later in post), the best part of Paprika is using it for meal planning & your grocery list. Meal planning is one of the easiest things you can do to save money on groceries. You'll know what you're making ahead of time and won't be tempted to eat out. It also saves you money through the grocery list feature, because it helps you to stick to your list and avoid impulse buys that can rack up a big bill at the checkout counter. I spent a weird amount of time researching various grocery list apps and eventually landed on Paprika, which does so much more than just list what you need to grab at the store. I couldn't be happier and now can't imagine how I would function without it. Paprika is an app available for the iPhone, iPad, Mac, Windows, Android, Kindle Fire, and Nook Color. I have both the iPhone app ($4.99) and the Mac app ($19.99) and I find having both super useful and well worth the price. I manage my recipes and meal plan on my laptop and take my grocery list with me on my phone. While I balked at the prices at first, it's worth it to spend $25 once to stay organized, eat healthfully, and save much more than the $25 you spent on the apps in the long run. 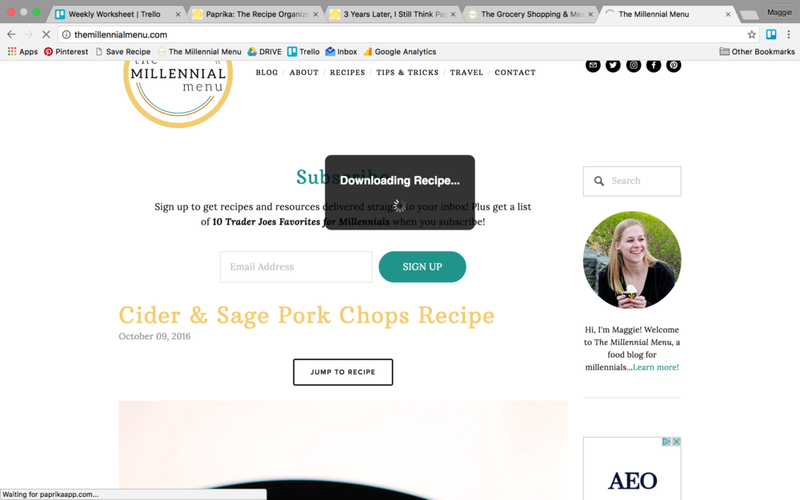 They have a friendly bookmarklet that scans a webpage you're on and downloads the recipe on the page to the app - there's no tedious input of ingredients or steps. You can also browse the web within the app and just hit the save recipe button. I have my recipes organized by tags like dinner, chicken, salads, etc. You can easily scale up or scale down recipes and the app will adjust the ingredient amounts accordingly. Perfect for when you're only cooking for one! You can add the ingredients of a recipe straight to your grocery list - no tedious input there, either! 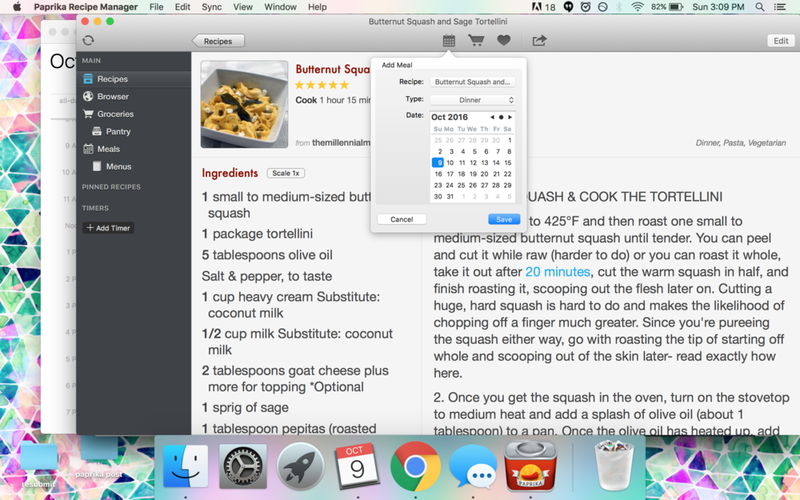 Finally, you can drag and drop recipes into the calendar function. I do this every single week to plan out what I'm going to make for dinner, then export the ingredient list to my grocery list and boom, I'm ready for a quick and inherently less expensive trip to the grocery store. When cooking, you can cross items off the recipe as you add them - never forget to add the eggs or add double the salt again! Browse recipes online (including on Pinterest!) 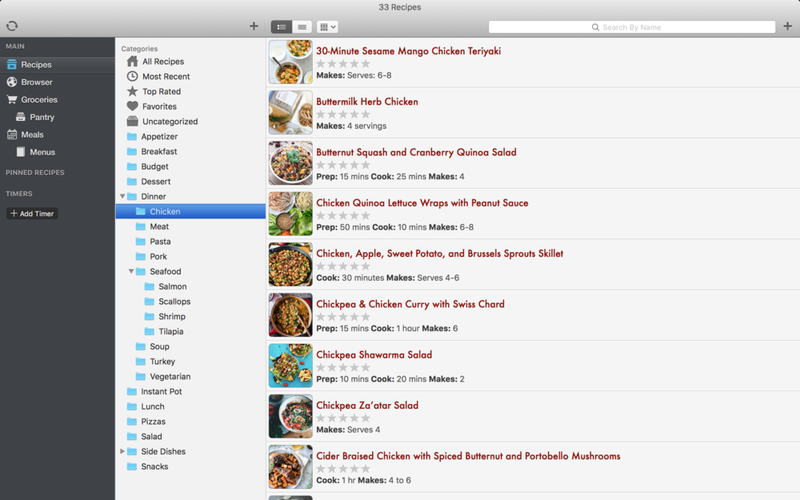 and add them directly to your Recipe Box with the "Save Recipe" button on the bottom left of the app. 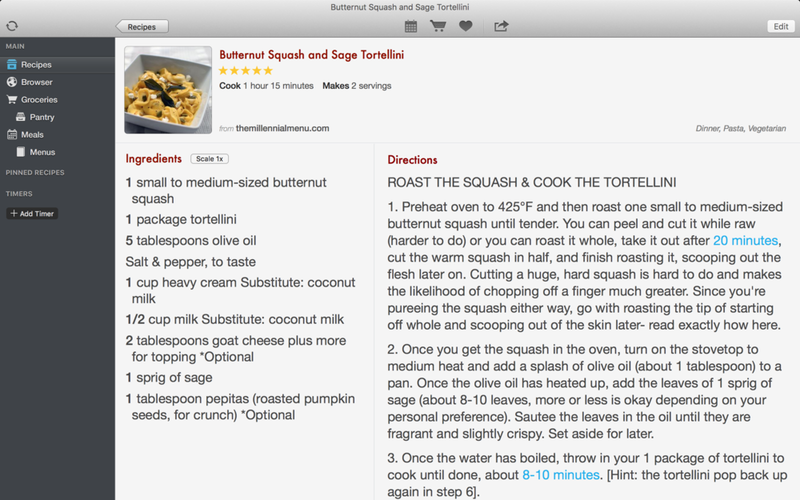 Or, add the "Save Recipe" bookmarklet to your toolbar to save recipes to the app from the web. Browse your saved recipes and tag them by categories to make choosing what to eat easy! Read and adjust recipes within the app. Scale recipes up or down depending on how many you're cooking for. Add the ingredients needed to your grocery list right from the recipe. The app even tells you when you already have something in your pantry based on your pantry list. Add recipes to your meal plan calendar! 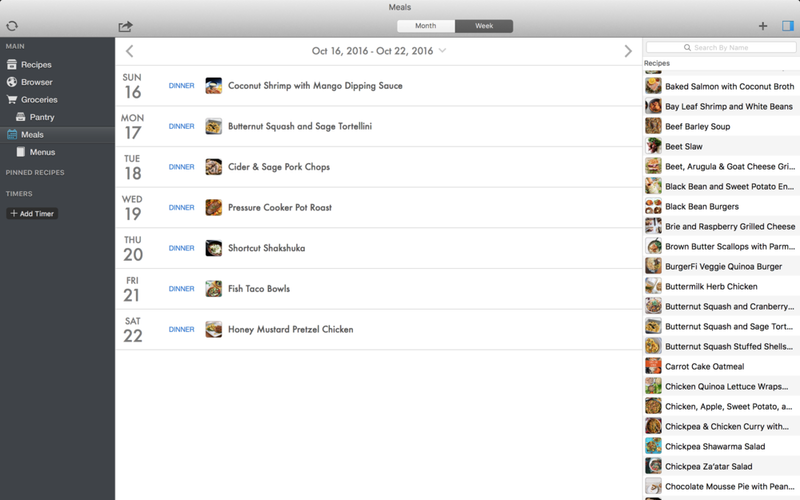 Or, drag and drop recipes onto days of the week from the sidebar menu within the app. Having my weekly meal plan laid out for me makes it easy to plan, shop, and eat! 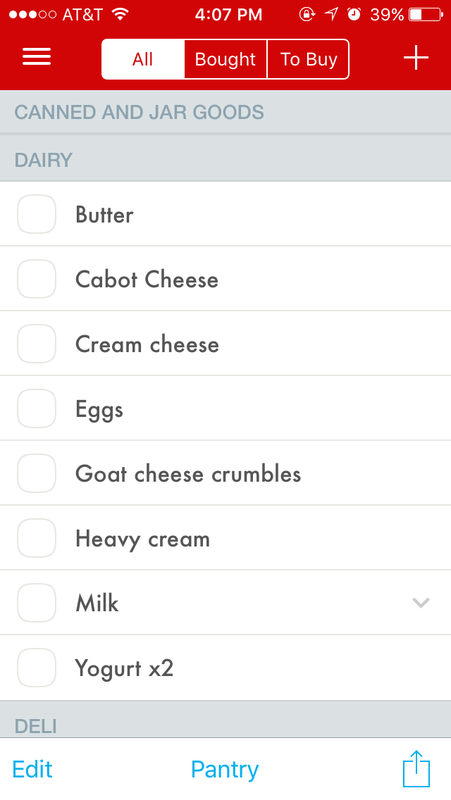 Review your final grocery list within the app and add, delete, or adjust items as necessary. ther than when I need to look at my calendar meal plan or a recipe on my phone (features that are both seamlessly integrated into the mobile app), I find the Paprika mobile app most useful for on-the-go grocery shopping. I pull it up when I'm at the grocery store and can see my entire list at once, or simply my "To Buy" column. I check off what I buy as I go, so I know what else I still need to get. First, I meal plan for the week and figure out what I'm making for dinner each night. Then, I can add the ingredients for a recipe (in this case, the tortellini) to my grocery list. The app already knows I have olive oil in my pantry! When it's time to cook, I pull up the recipe and cross ingredients off as I add them. You can even set timers within the app to make sure you don't forget anything as you're cooking! Whether you use Paprika for everything food related like I do, or just for your grocery list, there is definitely a way to make cooking and grocery shopping for yourself easier - and Paprika is it. Half the time, it's figuring out what to make and buying the ingredients that are the biggest barriers to healthy, home cooked meals. Once you commit to Paprika, dinner will be that much easier. See it live...watch a video demonstration! This is not a sponsored post - I just really like this app and find it so useful!